Continuing clockwise around World Showcase, we pass right past the Brewer’s Collection (because there’s only so much one can drink without ending up at Guest Relations) and land in Germany. If you do stop at Brewer’s Collection, there are some really interesting beers to try, including the much-hyped Schofferhofer Grapefruit (which is generally better in the bottle than what I’ve gotten at Food & Wine which last year was a bit skunky) and BraufactuM Roog Smoked Wheat Beer which I am very sad that I didn’t get to try. I’ll be on the lookout for that one. 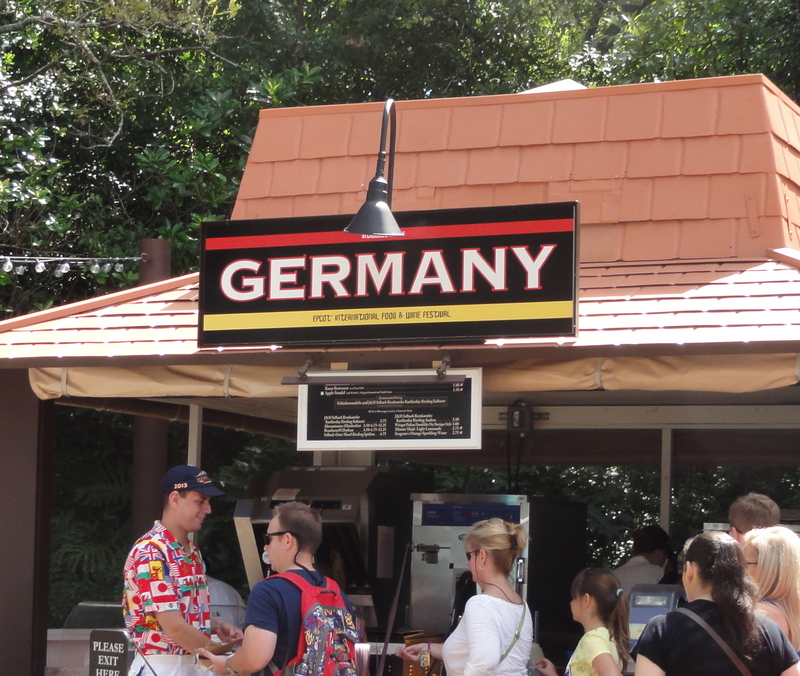 But this is about the Germany booth and the food at that booth, and we DID try each of the offerings here. Sadly nothing really stands out here as a “must-try”. It’s all fine comfort food, but not terribly exciting. It’s fine. Hard to go wrong with mac and cheese. I sort of wish they’d just leave out the ham though, so that there could be an additional vegetarian dish at Food and Wine. My vegetarian friends have precious few items that they can sample, and end up eating mostly desserts. It would be so easy to omit the ham here – it’s not doing much for the dish. A little less successful is the Roast Bratwurst in a Pretzel Roll. That’s one long brat! Overall it’s pretty mediocre, and we just didn’t really enjoy this. The roll is fine, though for some reason we like it much better at the Biergarten restaurant. If you’re a completist and must try everything at Food and Wine, then go for it, but otherwise I’d skip it. 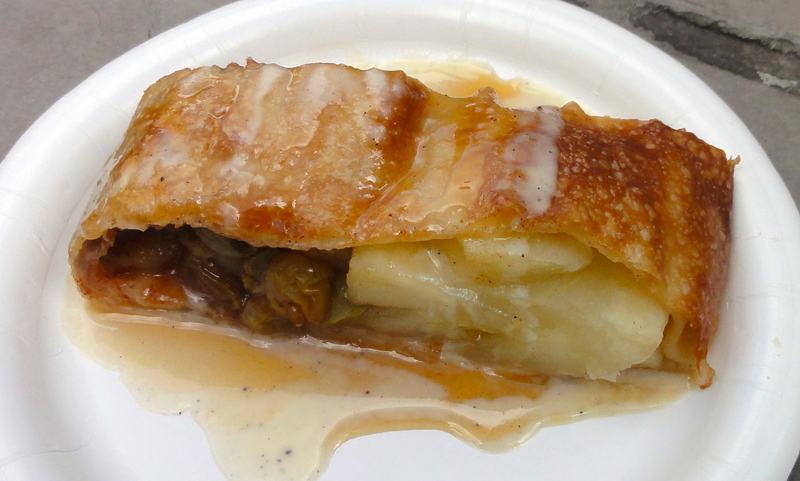 And for dessert, there’s Apple Strudel with Werther’s Original(r) Karamel & Vanilla Sauce. As you might expect, the apples, caramel, and vanilla sauce were really yummy. 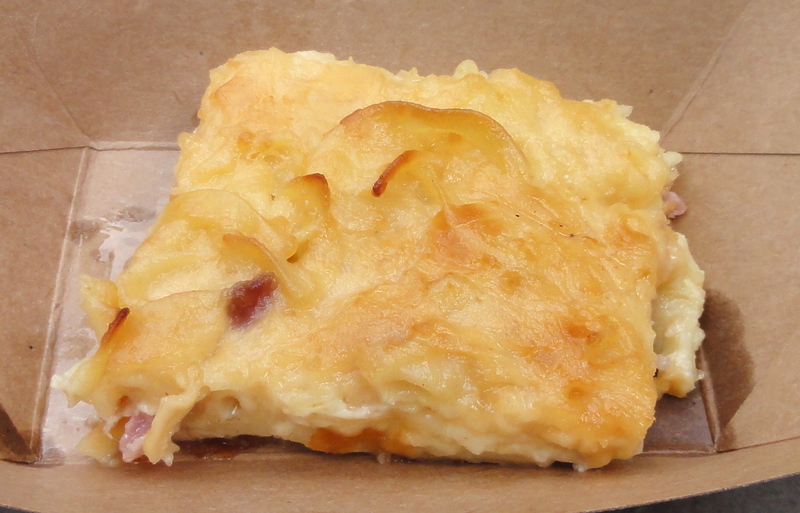 The crust though was sort of hard to eat – not flakey or crispy, so it made it hard to cut with the side of a fork. Still, this was my favorite dish in Germany. And ya know what? You can get this year-round. Last night, we announced the first ever MouseChow.com EPCOT Food and Wine Festival package! 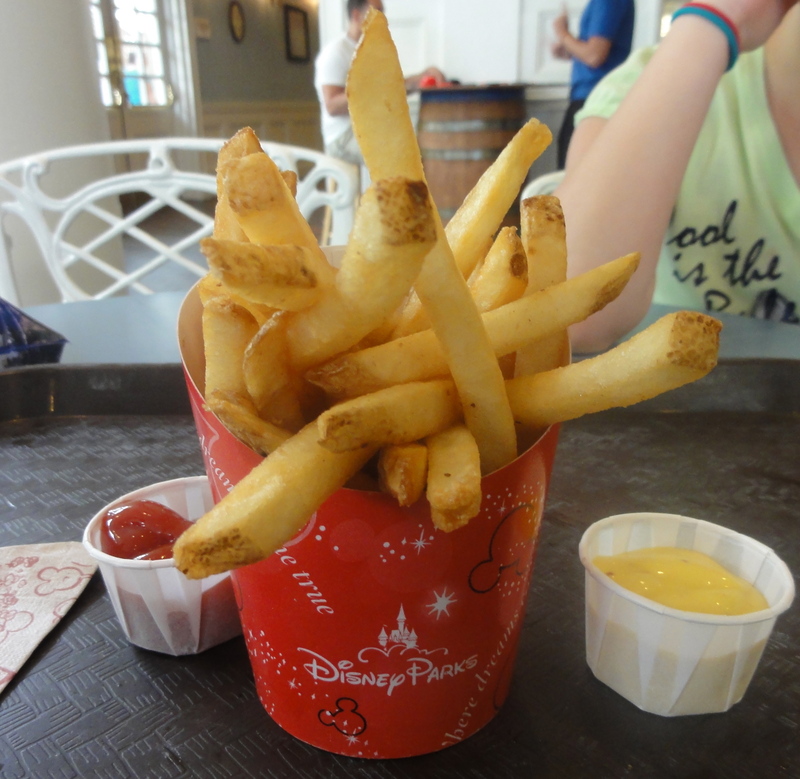 I’m incredibly excited to be able to bring this to my MouseChow readers, friends, and Disney Food Lovers everywhere, so I had to include it in the Wordless Wednesday blog hop hosted by Deb at focusedonthemagic.com. Make sure you read all about our super-fun package, packed full of awesome stuff you can’t find anywhere else. 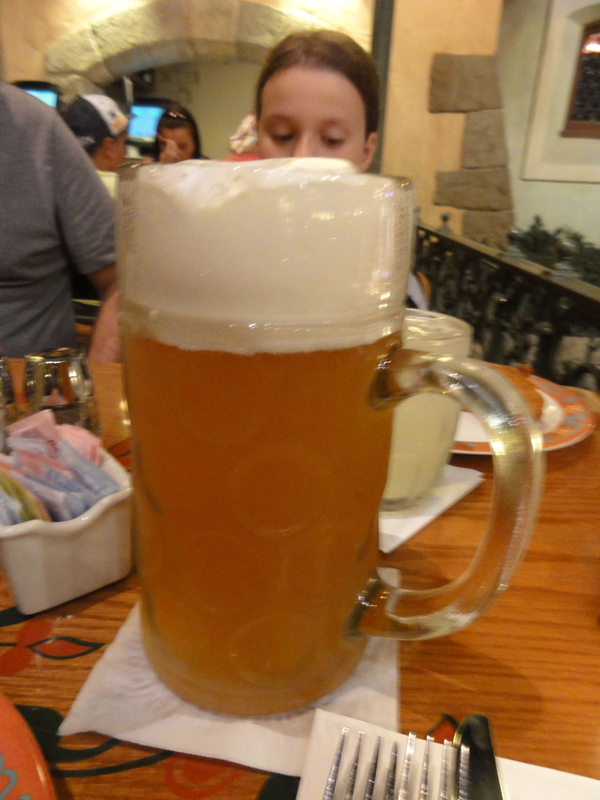 But in the meantime, here’s a very large beer from the Biergarten in the German Pavilion at EPCOT. …because the name may be Food and Wine, but we know it’s oh so much more. Have you been to the Food and Wine festival? Did you have a good time? Want to go back? Send me an email and I’ll send you a quote! dawn@mousechow.com. This needs no explanation. 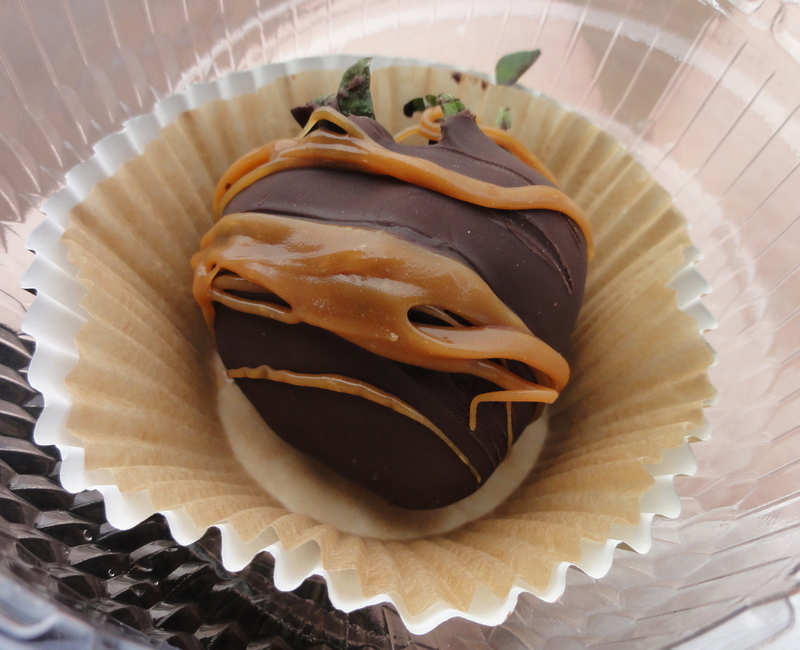 Werther’s caramel, milk chocolate, big ripe strawberry. 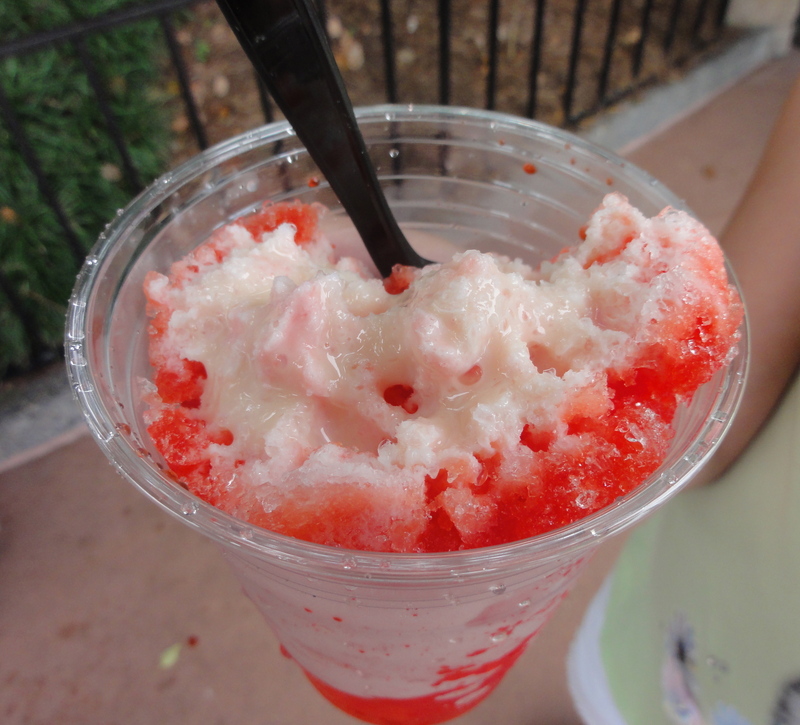 This is one of the most refreshing, delicious things you can eat on a hot Florida day. If you’re from Louisiana or Mississippi, you may recognize this – it’s the closest I’ve had to a snowball outside of Louisiana. The ice is shaved very fine and soft, with delicious, high-quality fruit syrup, with or without cream. Oddly, this is the orange flavor. It’s very red. And very good. Ahhhh….school bread. It has a cult-like following, and with good reason. So what is it? 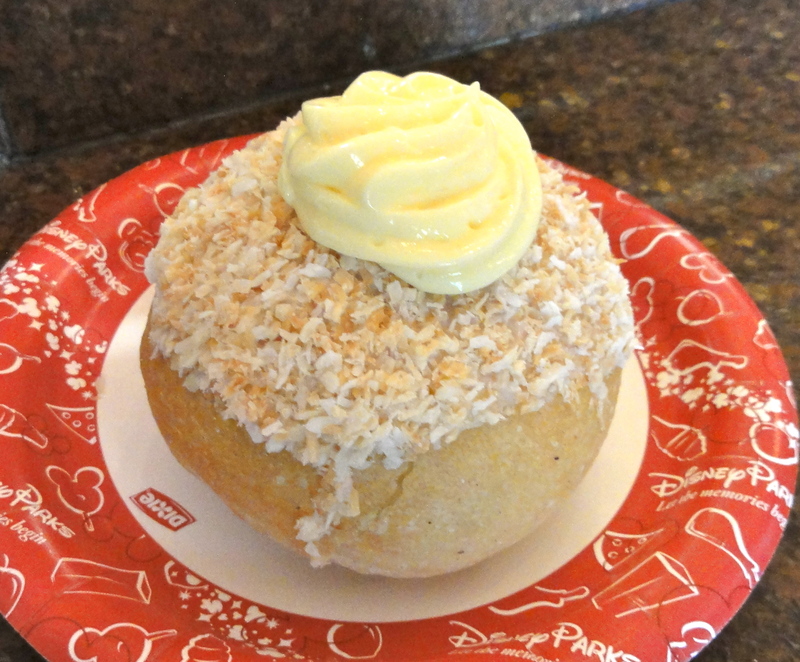 Imagine a raised yeast doughnut with no hole, filled with vanilla pastry cream, and topped with icing and toasted coconut. Perfection in its simplicity. Wow, my arteries are hardening just thinking about this scrumminess. 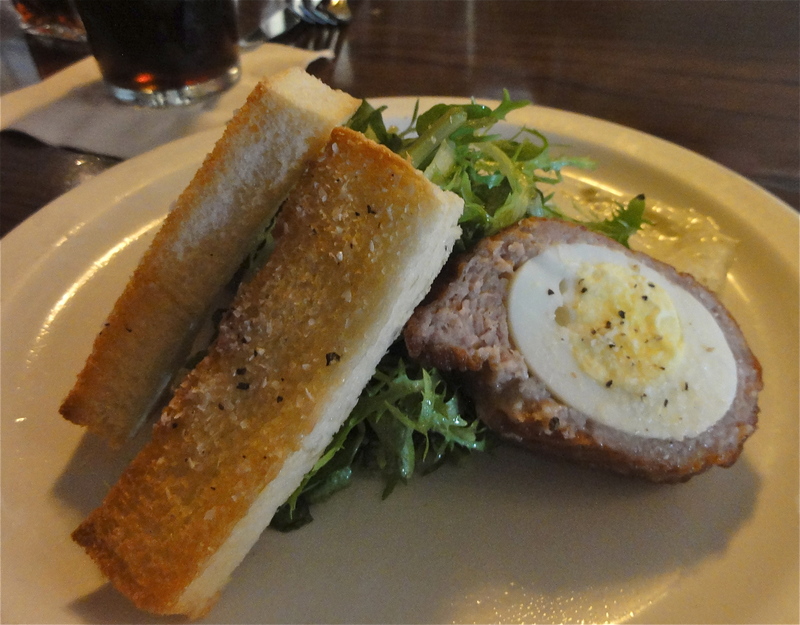 The Scotch egg is a hard-boiled egg, wrapped in sausage, and deep fried. It’s served with fried bread, mustard sauce, and a small green lightly-dressed salad. The sausage is very nicely spiced, and it’s all a bit salty, greasy, and exactly perfect with a pint of Bass ale. It sure was hard to narrow this list down to 5! I can think of several I left out that could easily have made it, and I’m sure you can too. So what did I miss? Feel free to discuss while I sit here in the corner with my Scotch egg.